Mike Wickersham is the president of Wick’s Pies in Winchester, Ind., a third generation family company. Wick’s Pies dates back to 1944 when Wickersham’s father, Duane (nicknamed “Wick”), opened a restaurant and began making pies. I visited Mrs. Wick’s Pie Shop, the restaurant across the street from the production facility, for a tourism story in the January-February issue of BizVoice magazine. Indiana Chamber: The sugar cream pie is delicious! I understand it is a patented recipe? Mike Wickersham: Bluebird Pie Company out of Dayton, Ohio, which was one of his large competitors, knew the popularity of his sugar cream pie and was trying to steal the recipe. So my dad decided it would be a good idea to get a patent on that, so he hired a local attorney and received a patent in July of 1962. He was concerned about losing that niche market that my dad had, because Bluebird was a lot larger than he was. 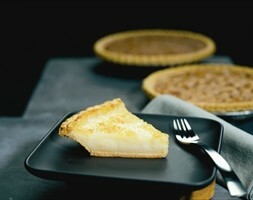 IC: Sugar cream pie was declared the state pie of Indiana in 2009. How has that designation impacted your business? MW: It’s brought a lot of familiarity to the product. That spring, we sold three times as many sugar cream pies as we had in any previous spring. We had a lot of interest from Illinois – if you’ll remember, they were trying to impeach their governor (Rod Blagojevich) at the same time. So I had radio stations call me from Illinois wanting to compare what their legislature was doing with our legislature. When you’ve got people talking about your product, it adds to the mystique and popularity and generally increases sales. IC: What other products do you offer? MW: In the Midwest, Wick’s brand is known for sugar cream pie and pecan pie, but throughout the country, we’re really known more for our pie shells. We ship pie shells into about 40 states around the country. We make pie shells as small as 3” and up to 10”. IC: Is there anything new on the horizon? MW: We’re in the process of establishing an e-commerce shopping site. We do a lot of mail order, and right now, a customer is required to buy at least six pies at a time and have them shipped overnight. That becomes rather expensive. We’re developing a website that would be an online shop for the consumer to buy as few as one and as many as six (pies), and it could be a variety of product, with an option of a second-day air. This entry was posted in BizVoice, Business News and tagged indiana, pie, sugar cream, wick's pies, winchester by Katie Coffin. Bookmark the permalink.